Well, I did get my Beta invitation on Friday morning. As is the case, I woke up at o’dark thirty for some reason and headed up to my loft where my computers live (so do I, if the truth were to be told) and started the download. To say that I was excited is a misnomer. I was doing the happy dance while I waited for a very long time to download the content. I really wasn’t disappointed when I logged in and saw that at long last the guards running through Orgrimmar had been removed and you didn’t have the giant Orcs mistreating the trolls everywhere you looked. Naturally, we couldn’t get to Draenor until later in the day because the developers were working on this “new” realm. This was not a problem for me because I like to explore and see how things have changed in the old content when a new xpac drops. I guess that I was one of the few lucky souls that was able to copy my main(s) over to the Beta. So, Fnor and Kaldor are sitting in the Beta as we speak. It was a very bumpy ride to start with I started playing and there were many disconnects and crashes as is expected when you’re doing any kind of software testing. You would play a few minutes and crash. The frustrating thing was that you’d play five minutes (if you were lucky) and then you’d spend the next ten to fifteen minutes trying to get back online with the game. The developers asked that you be in the game to “stress test” the introduction to Draenor later in the day and I will admit that I was there with the rest of the people. It was just like times when a new expansion drops and the whole world of players are all trying to get there “first” – very crowded. I am happy to say that I wasn’t the only one struggling along because over the years we have all become somewhat addon dependent and I am not an exception. Even though there was no announcement of the changes in the Old Content, I am happy to report that the graphics are very clean and both of my computers had no problem handling it. I wanted to make sure that my machines were going t be able to handle everything because I am not planning on buying any new ones or seriously upgrading the ones that I currently use. One of the things that I am extremely happy about is the bag space issue seems to have been dealt with nicely. If you have multiple items in your “refrigerator” from Pandaria, they all stack well over 100, so, that was a plus. Not only were those items stacked up, so were the items in my leatherworking bag as well. Awesome sauce!! The new “toy box” tab is going to be great because you can now carry around your toys with you instead of having to put them in the bank and go take them out when you were planning on using them. Not all of the toys that some of us have were listed in the tab, however, this is beta and I’m sure that things will be added over time. It seems that the bag space issue only dealt with the items in your bags – I haven’t checked the viability of this with my bank items, however, there will be time to do that too. The new models are just pretty nice and I think that most of the people will be pleased with them. I’m not too keen on the angry constipated look my Kaldorei females seem to have because they don’t look anything like I had chosen for them to look. I was happy to see that I wasn’t being bombarded with guild invitations every time I logged in. I’m not planning on going into a guild for a while because I don’t want the added pressure of “participating” in a guild while I am trying to get my feet back under me at the start. I didn’t think that the changes to the hunters was all that dramatic, however, it will take some getting used too. One of the things that I will admit that I was kind of surprised at was the fact that you couldn’t switch specs like you do in the current content, so, off I went in my Survival spec, which is not all bad. 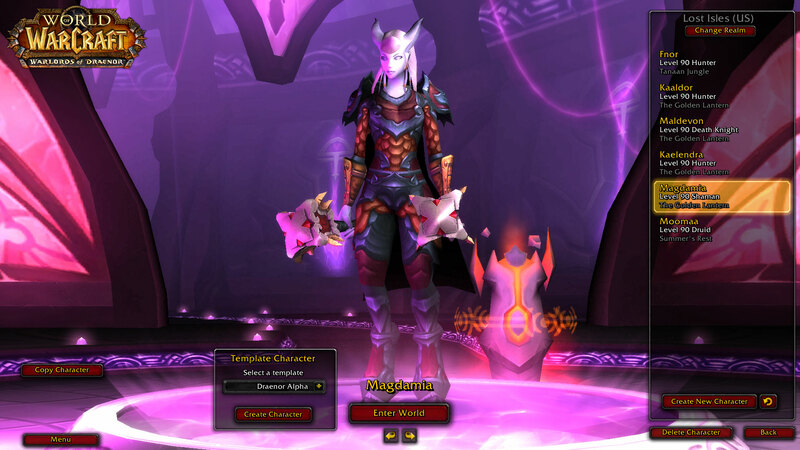 Since I am a person that has multiple alts still in various stages of leveling, I did go around and checked on that content and found that some of the things that weren’t broken before were now, however, I’m sure that Blizzard will fix that too. My plan is to copy over a different class to see how things have changed so that I can get myself prepared for the changes prior to the expansion dropping or even the first patch that will introduce these changes to the current content. Oh sure, there were plenty of complaints from people about how squishy things were and how their rotations were going to have to be changed. That is something that we have dealt with for each expansion that has dropped since classic. So far, it’s been fun. This entry was posted in Beta, OOC and tagged Fun Times, More Adventures To Come, World of Warcraft. Bookmark the permalink. Is that the new Draeni female model? She looks pretty good… can you take some ingame shots of the others,.or have they been done yet? Can’t really tell from the promos half the time. Oh, I need to send my Horde Warlock in there so I can see it from that side too although I think I’m going to wait until tomorrow and hopefully avoid the crowds a bit. Yes, having your mats stack over 20 is really, really nice! I love the bag stacking capability – LOL I tried to play in Beta earlier today – Sunday – duh, not a good plan, everybody and their friends are in there, talk about a log jam – I might make it to the actual Garrison area tomorrow. I’m anxious to see if there are two portals – one to the Old Outlands and One to Draenor – I have plenty of alts that still need to run Outland and let’s not forget Loremaster.